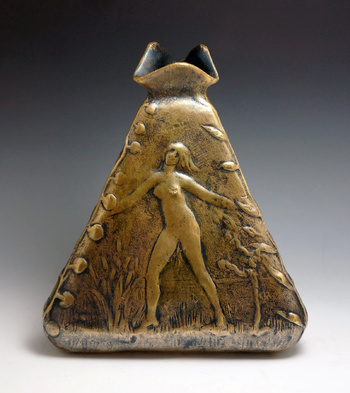 A lovely small textured triangular shaped bronze vase sculpted by Paul Moreau Vauthier (1871-1936) and produced by the F. Goldscheider (43 rue de Paradis, Paris, Fr) for exhibition at the 1898 La Societe des Artistes Francais. 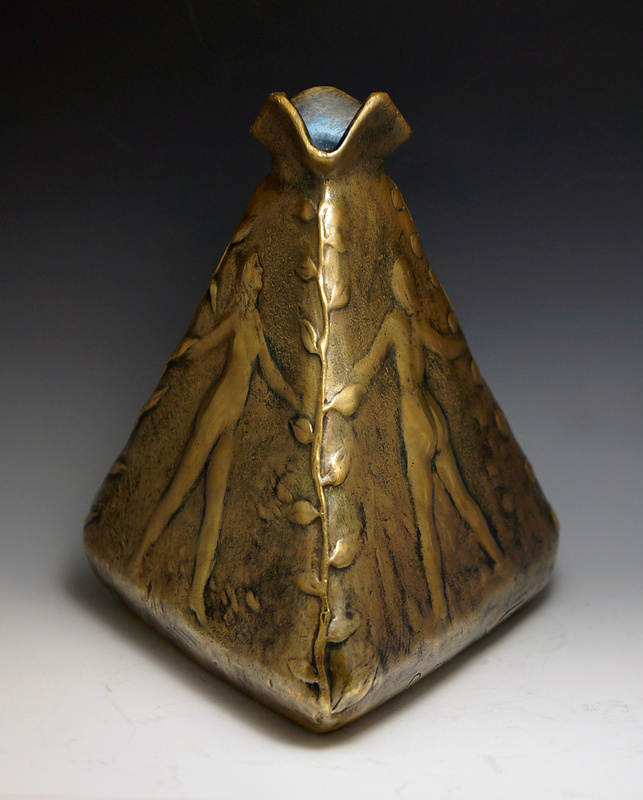 This symbolist themed vase has maidens holding hands on all three sides with climbing ivy along the edges. The underside has the Goldscheider seated female artist stamp impressed with a stylized PMV artist cypher and the number 36. The bottom is additionally impressed with "36/839," while the bottom edge of one of the vase sides is signed "P Moreau Vauthier." Dimensions: 5.5”(H) x 4.75”(W). 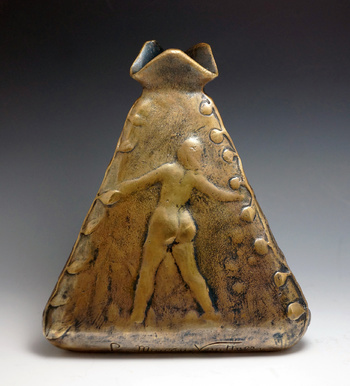 This vase is pictured on pg. 416 of Alastair Duncan’s “The Paris Salons 1895-1914: Volume V - Objets d’Art & Metalware." 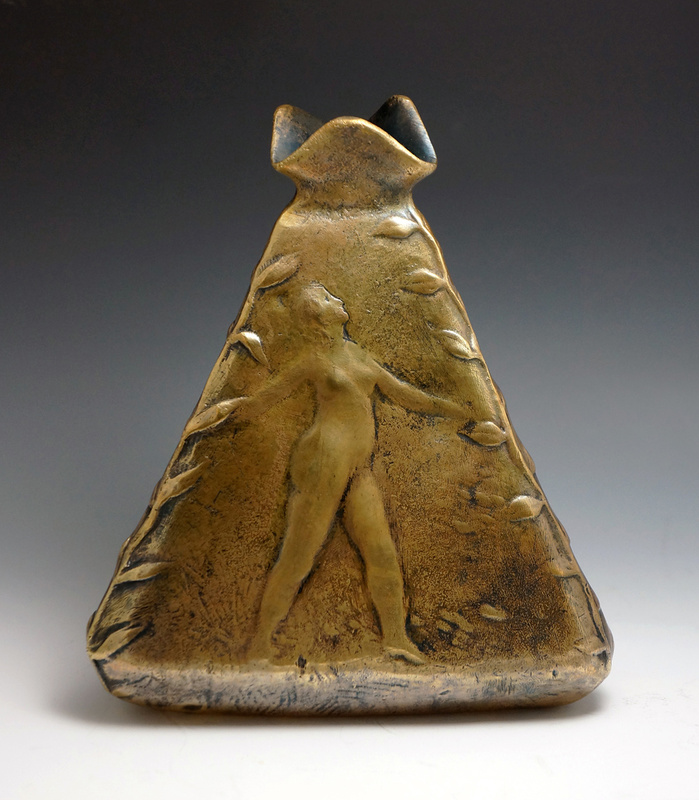 The son of famed sculptor, Augustin Moreau-Vauthier, Paul was born in Paris on 11/26/1871. He spent his childhood in his father's workshop and became a pupil at the Paris School of Fine Arts at an early age. It was during this developmental period as an artist that Paul Moreau-Vauthier trained under the sculptor, Gabriel Jules Thomas, and he was quick to adopt the artistic styles of the time, including Symbolist and Art Nouveau movements. He was a member of the Societe des Artistes Francais as of 1895. Moreau-Vauthier sculpted the famous entrance statue for the 1900 Exposition Universelle in Paris, entitled "Le Parisienne," and he won a Silver Medal at the Exposition for his work. He was later awarded a Gold Medal in 1928. Moreau-Vauthier was a known artistic collaborator with Eugene Rudier and Emile Decoeur, and he is known for producing masterworks that span the Art Nouveau/Art Deco eras. Moreau-Vauthier volunteered for military service in 1914 and was wounded at the Battle of Verdun. He incurred a serious head injury during the battle, which required trepanation, and as a recognition of his war time bravery he was later made an Officer of the Legion of Honor in 1928. He later died February 2, 1936 in a car accident on his way to Bordeaux. Thank you all. I've been searching one of his works for a long time. hi cogito, you always found buetifull items. can you give me the reference books? sounds interesting. from alastair duncan i have the art deco figures book. hi cogito thanks for the link, did hi also did somthing for the salon 1925? stunning!!!!! you've done it again cogito!! Thanks, Sean68! I've been slow to post lately, but will be adding a few more items in the weeks ahead. Cheers! cheers to you as well cogito! !